The tambora is a double sided drum used in various parts of Latin America. It is particularly popular in the Dominican Republic where it is used for the rhythmic foundation of merengue. 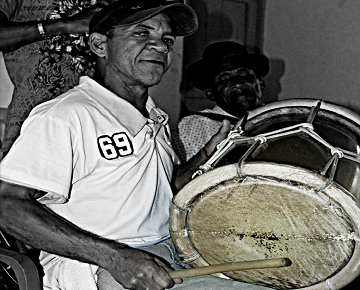 In the Dominican Republic, one side of the tambora is played with the hand, and the other with a stick. For right handed people, the left hand holds the stick. Hi John, the the stick used for tambora is considerably shorter than a regular drumstick. It is usually also a bit thicker. Perhaps you could cut a drumstick down to a manageable size. If you do, cut off the thinner end. i use the right hand for the stick... is that weird? i love this music, i use it for my classes a lot! la tambora es un instrumento musical. membranofono que ha formado parte fundamental de los conjuntos de merengue a lo largo de su historia. como se toca la tambora? se tocan con las manos y los palitos no suelen usarse siempre.